Jamuna Bank Limited job circular 2017 has been published on http://jamunabankbd.com/career. If you want to apply for this job, you should submit your application within 25 September 2017. Jamuna Bank Limited job circular 2017 has been given bellow. 2. Responsibilities: Jamuna Bank Limited a renowned private commercial bank having its business network with 112 branches across the country will pave the way for you to become one of our future leaders and build the career you dream of. a. Applicants should have 4 years' graduation in any subjects preferably in Business. Bank Management, Economics, CSE, Textile Engineering, Mechanical Engineering, EEE. Civil Engineering and/or MBA from the reputed universities. a. Maximum 30 years as on 25 September, 2017.
a. On Probation, Management Trainee/ Probationary Officer will receive monthly consolidated remuneration of Tk. 50.000/ Tk. 40,000 along with other admissible benefits within rules. Application deadline 25 September, 2017. Jamuna Bank Limited authority only short listed candidate will accept for examination. Every eligible pereson can downlaod admit card http://jamunabankbd.com/career. Jamuna Bank Limited authority will published as soon as possible. If you are a candidate you can check your seat plan by http://jamunabankbd.com/career. 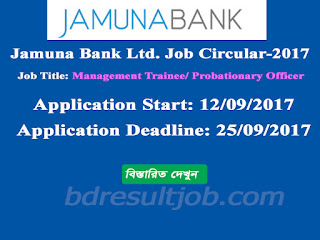 You found Jamuna Bank Limited Management Trainee/ Probationary Officer result http://jamunabankbd.com/career. Tags: jamunabankbd com career. 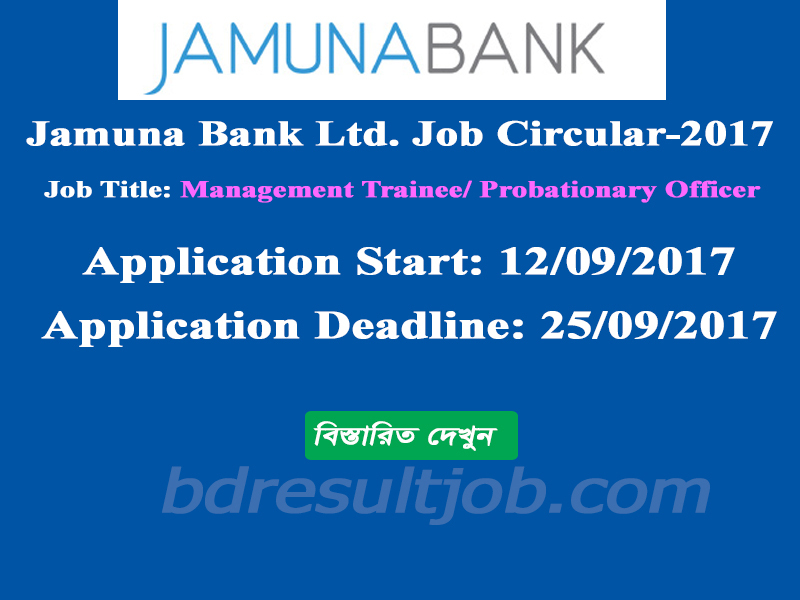 Jamuna Bank Limited Management Trainee/ Probationary Officer admit card. Jamuna Bank Limited Management Trainee/ Probationary Officer exam date 2017. Jamuna Bank Limited Management Trainee/ Probationary Officer result 2017. Jamuna Bank Limited Management Trainee/ Probationary Officer admit card 2017. Jamuna Bank Limited Management Trainee/ Probationary Officer admit card download 2017. Jamuna Bank Limited career.